This is a quick Mexican-style rice that we like to wrap up in a whole wheat tortilla with some seasoned pinto beans and avocado slices. It beats the pants off that quick yellow rice that comes in a foil package on so many levels. 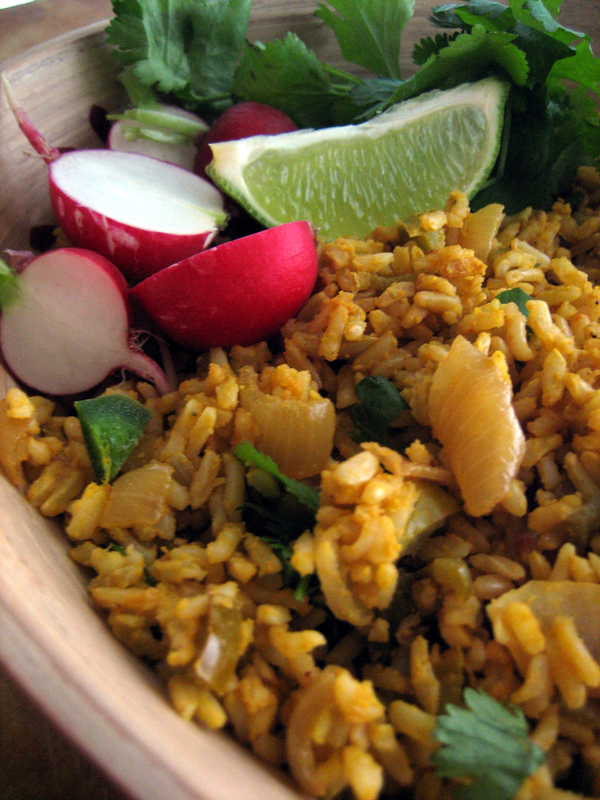 It’s also a great way to take leftover plain rice and morph it into an entirely different meal. Add the annatto seeds to the oil in a skillet over medium heat. Stir the seeds around for a couple of minutes, keeping them in the oil. Remove the seeds from the pan and discard. Add the onions and bell pepper. Sauté until softened. Add the garlic and chiles. Cook for another minute or so. Add the rice and Chik’Nish seasoning. Mix well to combine. [If your rice is leftover it may have dried out a bit in the refrigerator. If this is the case, just add a little bit of water to moisten it back up. I’d start with a tablespoon at a time until it’s soft again.] Squeeze the lime juice over the rice and serve hot. Yum! I have everything except the Chik’Nish seasoning, so this will be my lunch or dinner tonight. I have tons of Hatch green chiles that I froze this year, so its a perfect meal for me….right down to the annatto seeds! You’re very welcome Karyn :-). It’s such an easy way to transform leftovers into a very tasty meal. The Bueno chiles are really fresh – awesome, organic and amazing and I’m DYING to try them in this. Well done ladies, you have another winner here!!! !